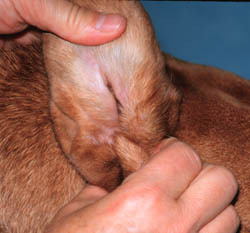 Dog ear cleaning as a routine procedure is usually done 1x a week. Cleaning due to dog ear problems such as infection, an infestation or allergies might require regular use of a cleaning solution as part of the treatment plan. In either case selecting the right dog ear wash solution is required in order to ensure that it works effectively and to avoid any damage to the ear. For regular dog ear cleaning, different high quality canine ear wash solutions are available commercially such as Nutri-Vet Ear Cleanse or the homeopathic dog ear cleaning solution Ear Dr. These preparations contain an adequate ratio of different components such as normal saline, mild antiseptics and additional components such as oils, soothing and deodorizing agents etc. Due to factors related to quality assurance, these commercial solutions are recommended for regular ear cleaning. However, a simpler form of such ear wash solutions can be prepared at home. Vinegar is one effective canine ear cleansing agent which has some anti microbial properties. Vinegar is acidic in nature, so it needs to be diluted before use. For regular dog ear cleaning, apple organic cedar vinegar can be used, 1/3 parts of vinegar are mixed with 2/3 parts of water. In order to maintain the quality of this mixture boil the water and let it cool down prior to mixing it with the vinegar. Cotton swabs or Q-Tips can be dipped in this mixture and then used for cleaning purposes. Vinegar is a relatively safe option as a dog ear wash solution. Rubbing alcohol and hydrogen per oxide (3%) can also be diluted and used as an alternative. For dog ear cleaning required for a problem like a parasitic infestation or infection, solutions containing different oils e.g. almond oil, olive oil etc combined with vitamin E can be an effective option. Also, Extract of garlic and mullein oil is a solution that has an anti microbial and anti fungal effect. 1 – 5 ml of these solutions are poured into a dog’s ear, and is massaged thoroughly at the base of the ear. Cleaning with regular canine ear wash solution is usually required thereafter. For a regular dog ear wash, the most appropriate approach is to soak cotton swabs or Q – Tips with the washing solution that is to be used for cleaning. 1 – 6 ml of the selected solution can be poured into the dog’s ear for this purpose, but due to risks of moisture and possible fungal and bacterial infections, it should not be practiced at home. 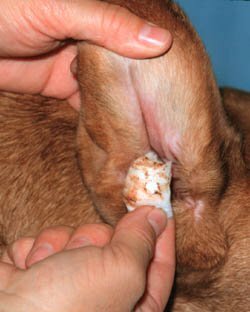 The procedure of cleaning a dog’s ear should be repeated with cotton swabs at least 3x, and a dog should be allowed to fairly shake it self to dry any extra moisture in the ear. In the case of any ear problems such as parasitic infestations and infections (bacterial or fungal), solutions should be introduced with care. If a veterinarian has recommended some therapeutic solution containing topical antibiotics/anti parasitic drugs in it or a simple solution prepared at home containing natural ingredients, it should be used as per instructions. Extra liquid should never be used. Dogs should be allowed to dry itself and extra oil flowing out of ear should be cleaned with a cotton swab. Cleaning deeper parts of the ear should not be tried at home; it should only be practiced by a professional groomer. Do not allow a dog to lick or ingest any of dog ear wash solutions. Vinegar can cause esophageal inflammation. Similarly mullein oil can cause a severe reduction in the production of digestive enzymes. If possible, avoid Q-Tips, prefer cotton swabs for cleaning. If you use Q-Tips a good rule of thumb is not to insert the Q-Tip into the ear past the point where you can see the tip. If you can't see the cotton part of the Q-Tip, it is in too far. Veterinarians must be consulted in the case of any emergency or if a problem in the ear is noted. Treating such cases at home can lead to irrecoverable damage to the dog’s ear.